Mt. Zion Temple, St. Paul, Mn. Mount Zion celebrates tradition, looks to future in state Pioneering congregation marks 160 years in state. Mount Zion Hebrew Association was founded in 1856 by eight German Jewish families who came up the Mississippi from St. Louis. Joseph Ullman and Isidor Rose were in the fur business. Other founders were in the clothing and liquor businesses. Mount Zion's charger was signed by Minnesota Territorial Governor Willis Gorman in 1857. Services were held in a rented room on Robert Street between 3rd and 4th Streets. In 1870, when the Congregation was fourteen years old, they build a wood-frame American Gothic style building for $750 on 10th and Minnesota Streets. It was eventually sold to the St. James African Methodist Episcopal Church, which moved it to Fuller Street. In 1878, Mount Zion formally adopted Reform Jewish practices and joined the Union of American Hebrew Congregations (now Union for Reform Judaism) and has been part of the Reform Movement ever since. At this brick site in 1881,the congregation build a brick structure in the Moorish style. As a sign of civic support, prominent non-Jewish citizens including Alexander Ramsey and Henry Sibley donated to the project. When the congregation moved in 1904, this building was sold to B'nai Abraham, one of several Jewish congregation (all Orthodox). 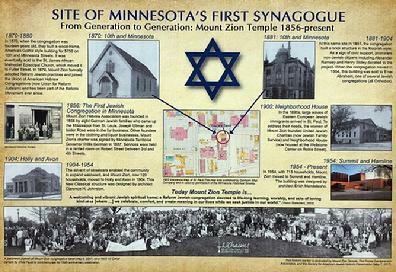 In the 1890's, large waves of Eastern European Jewish immigrants arrived in St. Paul. to address their needs, the women of Mount Zion founded United Jewish Charities (now Jewish Family Service) and Neighborhood House (now housed at the Wellstone Center on Robie Street). The advent of streetcars enabled the community to expand westward, and Mount Zion, now 120 households, moved to Holly and Avon in 1904. This new Classical structure was designed by architect Clarence H. Johnston. In 1954, with 713 households, Mount Zion moved to Summit and Hamline. The building was designed by architect Erich Mendelsohn. A panoramic portrait of Mount Zion Congregation taken May 6, 2007 on a 1922 Cirkut camera by Chris Faust to commemorate its 150th anniversary celebration.